Wisdom can be defined as the knowledge of what is right and true. The ancient Greeks discussed, debated, and studied wisdom. This is called philosophy. The word philosophy comes from a Greek term meaning “the love of wisdom. The Greeks believed they could become wise by using reason. Reason is the ability to think clearly. Greek philosophers developed logic, a step-by-step method of using reason to think through a problem. A philosopher named Socrates challenged the leaders of Athens by asked his students to use reason and logic instead of following the directions of the leaders of Athens. Socrates was a retired stonecutter. As a young man he fought in the Peloponnesian War and served in the boule, but he devoted the last years of his life to philosophy. Socrates believed that we all could find truth by thinking logically and trusting our inner voices. Socrates told his students that “wisdom begins in wonder." Socrates did not teach in a school. The old philosopher drifted around Athens, engaging his students in arguments about justice, bravery, and ethics. Socrates taught by asking questions that forced his students to use logic. When teachers ask questions that encourage students to draw conclusions, they are using the “Socratic method” of teaching. A priest called the Oracle of Delphi pronounced Socrates the wisest man in Greece. Socrates concluded that while others professed knowledge they did not have, Socrates knew how little he knew. Socrates asked many questions, but he gave few answers. He often denied knowing the answers to the questions he asked. Socrates did not write any books because he believed in the superiority of rhetoric over writing. Rhetoric is speech that is used to persuade someone. What we know about Socrates comes mostly from his student, Plato. Plato wrote down his teacher’s ideas in a series of dialogues. A dialogue is a conversation between two people. Athens had recently lost the Peloponnesian War to Sparta, and the humiliated leaders of the polis did not want a critic like Socrates challenging their authority. Socrates called himself a “gadfly." A gadfly is a pest that bites livestock. Socrates tried to use his criticism of Athens to “sting" the polis into recovering the Golden Age that existed before the long war. The Athenian leaders threatened to bring Socrates to trial on two charges. Socrates refused to honor the gods. He was also charged with corrupting the youth of Athens by teaching the young people to trust their own judgment instead of following the rules of the city leaders. Most Athenians expected the seventy-year-old Socrates to leave Athens before his arrest, but the old philosopher remained in Athens, stood trial, and was found guilty. 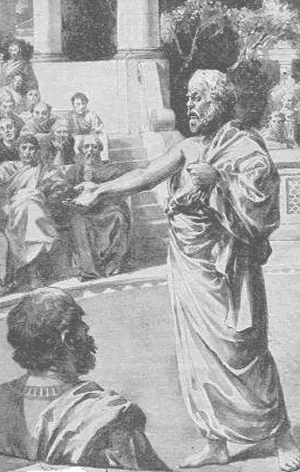 Socrates refused to participate in a plan to escape from prison. The philosopher calmly accepted his death by drinking from a cup of poison hemlock, the customary practice of execution of his time. Socrates believed that he must obey the law, even if he disagreed with it. Socrates (c. 470 – 399 BCE) was considered to be the first moral philosopher of Western Greek philosophy. Socrates did not write down his philosophy, so he is known chiefly through the writing of Plato and other later philosophers. 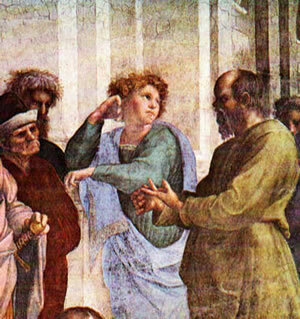 Socrates (left) is depicted in Raphael’s The School of Athens (1509). 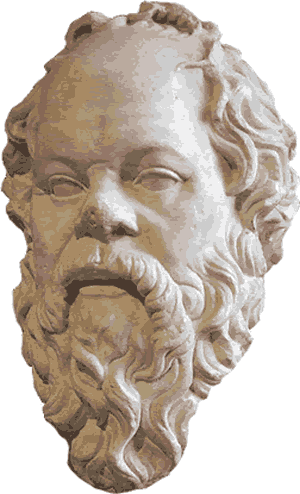 Athens tried Socrates for both for refusing to honor the Greek gods and for corrupting the youth of Athens. When he was found guilty, the philosopher was asked what he believed would be an appropriate punishment. Socrates jokingly suggested he be given free meals. The court instead sentenced him to death.